Simply Spectacular! 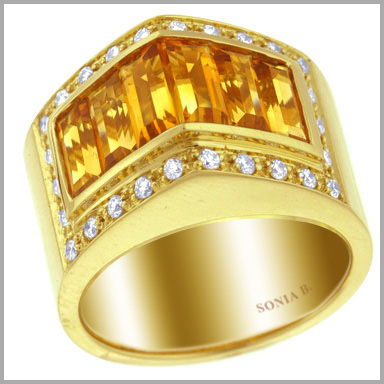 Crafted in polished 18K yellow gold, this ring features 6 baguette cut citrines in channel settings. It also features 26 full round cut diamonds in pave or prong settings. There is also an undergallery for added beauty and comfort. The total diamond weight is approximately 0.390 ct with a color of H and clarity of SI. Citrine total weight is 2.28.